Highlights of the Baltimore Ravens' trip to the Los Angeles Chargers in Week 16 of the NFL. The Baltimore Ravens defense lived up to the hype Saturday night, keeping the Los Angeles Chargers offense in check in a 22-10 road victory that improves their playoff chances. The Ravens (9-6) held the Chargers to 73 yards of total offense in the first half and 198 for the game on their way to a fifth win in six games. With the Chargers driving for a potential go-ahead score with less than three minutes remaining, Ravens linebacker Patrick Onwuasor forced a fumble off of veteran tight end Antonio Gates, and cornerback Tavon Young returned it 62 yards for a touchdown and a 22-10 lead. Earlier, in the third quarter, Ravens rookie quarterback Lamar Jackson threw the longest touchdown pass of his brief NFL career, a 68-yarder to Mark Andrews which wrestled back the lead for Baltimore. 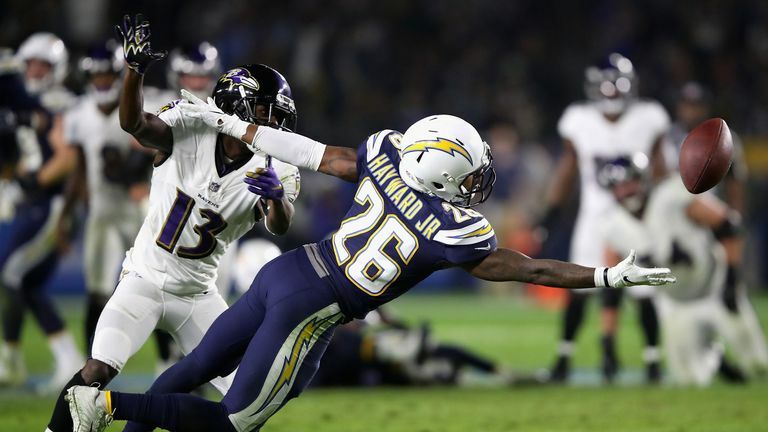 Andrews' touchdown, which gave the Ravens a 13-10 advantage, came two plays after the Chargers had edged ahead 10-6 following a one-yard touchdown run by Melvin Gordon, who was back after missing the previous three games with a knee injury. The Ravens' defense sacked Chargers quarterback Philip Rivers four times and forced three turnovers as the Chargers (11-4) saw their four-game win streak come to an end. Cornerback Brandon Carr set the tone for the Ravens defense early with an interception on the very first play of the game.